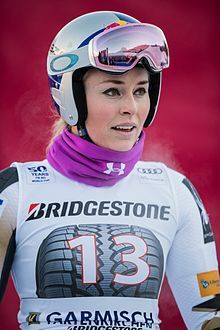 Lindsey Caroline Vonn (née Kildow /kɪldaʊ/; born October 18, 1984) is an American former World Cup alpine ski racer on the US Ski Team. She won four World Cup overall championships—one of only two female skiers to do so, along with Annemarie Moser-Pröll—with three consecutive titles in 2008, 2009, and 2010, plus another in 2012. Vonn won the gold medal in downhill at the 2010 Winter Olympics, the first one for an American woman. She also won a record 8 World Cup season titles in the downhill discipline (2008–2013, 2015, 2016), 5 titles in super-G (2009–2012, 2015), and 3 consecutive titles in the combined (2010–2012). In 2016, she won her 20th World Cup crystal globe title, the overall record for men or women, surpassing Ingemar Stenmark of Sweden, who won 19 globes from 1975 to 1984. She has the second highest super ranking of all skiers, men or women. Vonn started dating P.K. Subban  (a defenseman for the NHL Nashville Predators team) in June 2018 after her relationship with NFL coach Kenan Smith ended. ↑ Svrluga, Barry (2018-02-21). "Bronze doesn't begin to tell the story of the greatest female ski racer of all time". Washington Post. ISSN 0190-8286. Archived from the original on 2018-02-21. Retrieved 2018-02-21. ↑ "Nadal and Vonn win Laureus awards". BBC News. February 7, 2011. ↑ "Lindsey Vonn ancestry". Freepages.genealogy.rootsweb.ancestry.com. Retrieved March 18, 2013. 1 2 Barry Svrluga (December 9, 2005). "From Turtle to Snow Hare". Washington Post. Retrieved February 18, 2010. ↑ "Lindsey Vonn profile". Vancouver 2010 Winter Olympics. Archived from the original on February 17, 2010. ↑ Silvey, Janese (February 18, 2010). "Vonn went to MU High School". Columbiatribune.com. Archived from the original on April 4, 2012. Retrieved October 26, 2011. ↑ "Lindsay Vonn Interview Deutsch im ZDF". Retrieved December 18, 2018. ↑ Holland, Rebecca (2018-02-08). "Don Kildow, Lindsey Vonn's Grandfather: 5 Fast Facts You Need to Know". Heavy.com. Retrieved 2018-02-12. ↑ "Ski and Snowboard Club Vail". Skiclubvail.org. Retrieved 2018-02-20. ↑ "Tom Krebs". Vail Daily.com. Retrieved 2013-04-20. 1 2 "Ski and Snowboard Club Vail". Skiclubvail.org. Retrieved 2017-03-01. ↑ "Ski and Snowboard Club Vail". Skiclubvail.org. Retrieved 2017-03-01. 1 2 "Trofeo topolino". Trofeo topolino. Archived from the original on February 22, 2014. Retrieved February 9, 2014. ↑ "Trofeo topolino". Trofeo topolino. Archived from the original on February 22, 2014. Retrieved February 9, 2014. ↑ Robinson, Charles, Frenemy lines: Vonn seals spot as USA’s ‘top dog’, Yahoo! Sports, February 17, 2010. Accessed 2012-3-19. ↑ Donaldson, Amy (February 4, 2009). "Vonn wins super-G for her first title as world champ". Deseret News. Retrieved February 6, 2009. ↑ Campbell, Dean (September 7, 2009). "Lindsey Vonn switches to ski supplier Head". CTV. Retrieved January 14, 2010. ↑ "Snow Kings Ski Site – Ski Racing – Skieur d'Or Award". Snowkings.co.uk. Archived from the original on November 3, 2011. Retrieved October 26, 2011. ↑ Willemsen, Eric (December 28, 2009). "Lindsey Vonn falls, bruises bone in left arm". Associated Press. Retrieved December 28, 2009. ↑ Boniface, Dan (January 14, 2010). "Vonn is Colorado's Athlete of the Year". NBCOlympics.com. Retrieved January 14, 2010. ↑ BBC (January 31, 2010). "American Lindsey Vonn claims world super-G title". BBC News. Retrieved February 18, 2010. 1 2 "Lindsey Vonn Wins 3rd Straight World Cup Title". Fox News. Associated Press. March 12, 2010. Retrieved March 12, 2010. ↑ The Associated Press (December 19, 2010). "Lindsey Vonn selected as AP's Female Athlete of the Year". USA Today. Retrieved November 20, 2013. ↑ Almond, Elliott (February 3, 2010). "A gold medal could make Lindsey Vonn the darling of the Vancouver Games". Mercury News. Retrieved February 10, 2010. ↑ "US star Vonn reveals shin injury". Bangkok Post. February 11, 2010. Retrieved February 10, 2010. ↑ Michael C. Lewis (February 13, 2010). "Bad weather giving Vonn extra time to recover". The Salt Lake Tribune. Archived from the original on February 18, 2010. Retrieved February 17, 2010. ↑ "USA's Lindsey Vonn Takes Gold in Downhill". CBS Sports. Associated Press. February 17, 2010. ↑ Dunbar, Graham (February 18, 2010). "Vonn crashes, as Riesch takes super-combined title". Associated Press. ↑ "Fischbacher and Maze upset Vonn in super-G". February 20, 2010. ↑ Dampf, Andrew (February 20, 2010). "Fischbacher and Maze upset Vonn in super-G". Associated Press. ↑ Dampf, Andrew (February 24, 2010). "Vonn crashes in 1st run of giant slalom". Associated Press. Archived from the original on February 27, 2010. ↑ Lynn Zinser and Bill Pennington (February 24, 2010). "Vonn Crashes Out of Giant Slalom". The New York Times. ↑ "'Bummer' for Lindsey Vonn as she misses 2,000-point record". USA Today. March 18, 2012. Retrieved March 18, 2013. ↑ "After talking with..." Facebook. Retrieved March 18, 2013. ↑ "Audi FIS Alpine Ski World Cup – Function "Results from a race"". Fisalpine.com. Retrieved March 18, 2013. ↑ "Vonn Tears Ligaments in Right Knee, out for Season". US Skiteam. Retrieved February 5, 2013. ↑ "Vonn vows to be ready for 2014 Olympics". New York Post. Retrieved February 25, 2013. 1 2 Wharton, David (October 23, 2013). "Lindsey Vonn postpones return to competitive skiing". Los Angeles Times. Retrieved October 26, 2013. ↑ Kasica, Stephen Wayne (November 20, 2013). "Lindsey Vonn Injured in Training Crash". Outside. Retrieved November 21, 2013. ↑ Fendrich, Howard (December 6, 2013). "Lindsey Vonn Races 10 Months After Tearing Knee". ABC News. Retrieved December 6, 2013. ↑ Pugmire, Jerome (December 21, 2013). "Vonn is optimistic about Sochi despite new setback". Miami Herald. Retrieved December 21, 2013. ↑ "Lindsey Vonn". Facebook. Retrieved February 9, 2014. ↑ "Lindsey Vonn will not compete in 2014 Sochi Olympics due to knee injury – ESPN". Espn.go.com. January 7, 2014. Retrieved February 9, 2014. ↑ "Lindsey Vonn wins World Cup Downhill at Lake Louise". calgarysun.com. December 6, 2014. Archived from the original on December 13, 2014. Retrieved February 1, 2015. ↑ "Anna Fenninger wins gold in super-G at 2015 Worlds; Lindsey Vonn takes bronze". denverpost.com. February 3, 2015. Retrieved February 5, 2015. ↑ "Lindsey Vonn claims race, title". ESPN. March 18, 2015. Retrieved March 19, 2015. ↑ Pugmire, Jerome (March 19, 2015). "Vonn clinches World Cup super-G title and ties with Stenmark". Yahoo News. Retrieved March 19, 2015. ↑ "Lindsey Vonn ties World Cup titles record with 67th win under pressure". NBC Sports. March 19, 2015. Retrieved March 20, 2015. ↑ Zaccardi, Nick (December 6, 2015). "Lindsey Vonn grabs 70th World Cup win with weekend sweep". NBC sports. Retrieved December 6, 2015. ↑ "Lindsey Vonn Fractures Arm, Putting Her World Cup Season in Question". The New York Times. November 11, 2016. ↑ "Emotional Vonn gets WC win No. 77 after injuries". ESPN.com. Retrieved 2017-01-23. ↑ "Lindsey Vonn debuts at Pyeongchang Olympics, fails to medal in women's super-G". Espn.com. 2013-07-16. Retrieved 2018-02-20. ↑ "Women's Downhill Live Results". nytimes.com. 2018-02-20. Retrieved 2018-02-20. ↑ Seth Rubinroitt. "The secret messages Lindsey Vonn wrote on her Olympic race suit". nbcolympics.com. Retrieved 2018-02-23. ↑ Up Next. "Lindsey Vonn Wins Bronze, Cries". Msn.com. Retrieved 2018-02-22. ↑ Cindy Boren. "Lindsey Vonn breaks down in tears after final Olympic downhill race". washingtonpost.com. Retrieved 2018-02-23. ↑ Hyung-Jin Kim. "Lindsey Vonn Scatters the Ashes of Her Grandfather, a Korean War Vet, Near the Olympic Downhill Course". time.com. Retrieved 2018-02-23. ↑ "Lindsey Vonn: US skier to retire at the end of the 2018-19 season". bbc.co.uk. 11 October 2018. Retrieved 17 November 2018. ↑ Hodgetts, Rob (21 November 2018). "Lindsey Vonn injures knee, delays season start". cnn.com. Retrieved 24 November 2018. ↑ Graham, Pat (1 December 2018). "Lindsey Vonn postpones retirement to return to Lake Louise next season". CBC.ca. Retrieved 27 December 2018. ↑ "Ramona Siebenhofer wins back-to-back downhills, Lindsey Vonn finishes ninth". BT Sport ESPN. 19 January 2019. Retrieved 31 January 2019. ↑ "Lindsey Vonn considers immediate retirement as injuries take their toll". cnn.com. 20 January 2019. Retrieved 2 February 2019. ↑ Schad, Tom. "U.S. skier and Olympic gold medalist Lindsey Vonn announces retirement". USA Today. Retrieved 1 February 2019. ↑ hermesauto (2019-02-10). "Skiing: Lindsey Vonn takes bronze in swansong as Ilka Stuhec retains world downhill crown". The Straits Times. Retrieved 2019-02-10. ↑ CNN, Aimee Lewis. "Lindsey Vonn: Donwhill bronze for the American in final race". CNN. Retrieved 2019-02-11. ↑ "Skier Lindsey Vonn divorcing husband of four years". ESPN.com. November 27, 2011. Retrieved November 28, 2011. ↑ "Olympic Skier Lindsey Vonn Crosses Finish Line … In Her Divorce". TMZ.com. January 9, 2013. Retrieved January 9, 2013. ↑ "Tiger Woods announces his relationship with Lindsey Vonn". USA Today. March 18, 2013. Retrieved March 18, 2013. ↑ Webber, Stephanie (May 4, 2015). "Tiger Woods, Lindsey Vonn Split After Three Years of Dating: Read Her Statement". Us Weekly. Retrieved May 4, 2015. ↑ Peters, Micah (November 30, 2015). "Lindsey Vonn says she still loves Tiger Woods". USA Today. Retrieved December 1, 2015. ↑ "Lindsey Vonn And Boyfriend P.K. Subban Go Together Like Snow And Ice". February 8, 2019. Retrieved February 15, 2019. ↑ "2010 Sports Illustrated Swimsuit Edition". CNN. Retrieved May 7, 2010. ↑ "2010 Hot 100". Maxim.com. September 25, 2011. Retrieved October 26, 2011.